. Grant S, Freemerman AJ, Gregory PC, et al. 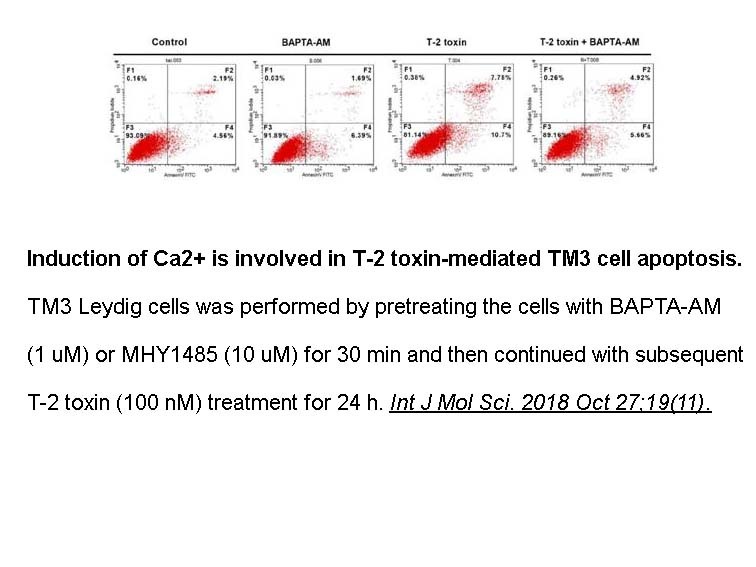 Induction of apoptotic DNA fragmentation and c-jun downregulation in human myeloid leukemia cells by the permeant Ca2+ chelator BAPTA/AM. 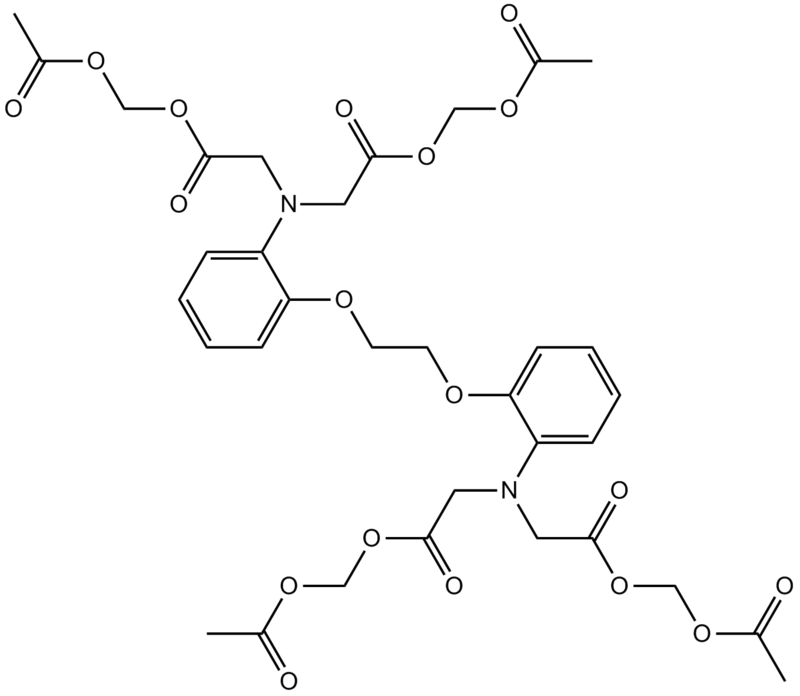 Oncol Res, 1995, 7(7-8): 381-392.
. Urbano FJ, Buo W. BAPTA-AM blocks both voltage-gated and Ca2+-activated K+ currents in cultured bovine chromaffin cells. Neuroreport, 1998, 9(15): 3403-3407. Balio P, Monferrer L, Pastor R, et al. Intracellular calcium chelation with BAPTA-AM modulates ethanol-induced behavioral effects in mice. Exp Neurol, 2012, 234(2): 446-453. BAPTA-AM是一种选择性的细胞膜可透过的钙螯合剂.在人类白血病细胞系HL-60和U937中,BAPTA/AM(10 μM)可诱导核小体间的DNA剪切和经典凋亡形态.并且,BAPTA/AM可提高胞内Ca2+,下调c-jun.在牛嗜铬细胞中,APTA-AM(50 μM)可迅速可逆地抑制50%的Ca2+活化的K+(I(KCa))和电压门控的K+(I(K)).在HEK 293细胞中,BAPTA-AM可以浓度依赖的方式抑制hERG(Kv11.1)\hKv1.3和hKv1.5通道,IC50值分别为1.3\1.45和1.23 μM,这依赖于通道开放.
. Tang Q, Jin MW, Xiang JZ, et al. 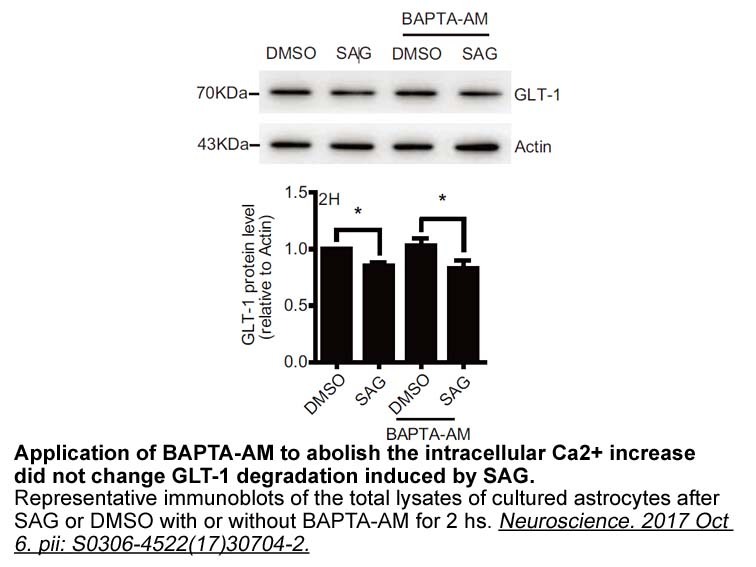 The membrane permeable calcium chelator BAPTA-AM directly blocks human ether a-go-go-related gene potassium channels stably expressed in HEK 293 cells. Biochem Pharmacol, 2007, 74(11): 1596-1607.
. Balio P, Monferrer L, Pastor R, et al. Intracellular calcium chelation with BAPTA-AM modulates ethanol-induced behavioral effects in mice. Exp Neurol, 2012, 234(2): 446-453.